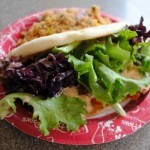 Guest author Rebecca Dolan returns today with a restaurant review from Disney’s Hollywood Studios. Let’s join her at The Hollywood Brown Derby! Recalling the golden days of Tinseltown, The Hollywood Brown Derby sits just beyond where Sunset and Hollywood Boulevards converge. 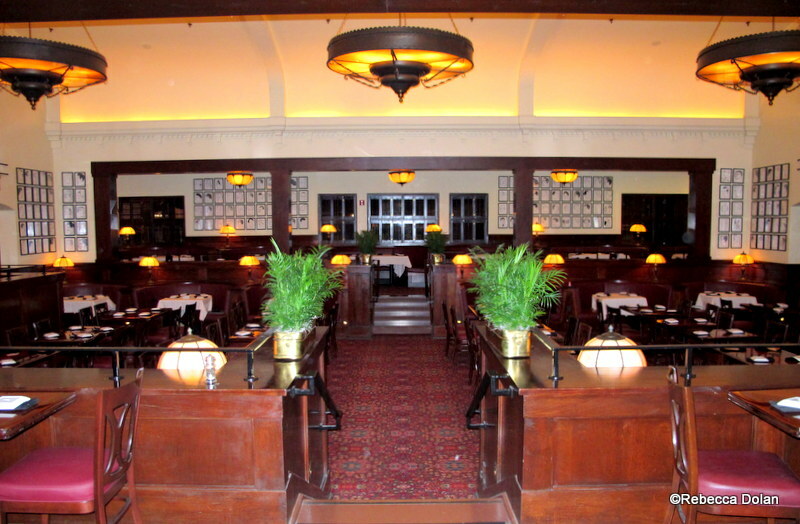 A replica of the once iconic California restaurant, where famous faces of the day met to see and be seen, it exudes ‘30s/’40s style. “Meet me at the Derby” and let your inner star or starlet shine. The restaurant is located in a Mission-style building complete with tile roof and crawling bougainvillea. The building is fairly understated, but a neon Derby sign on the roof gives it away. A long awning-covered walkway leads the way into the small check in area. 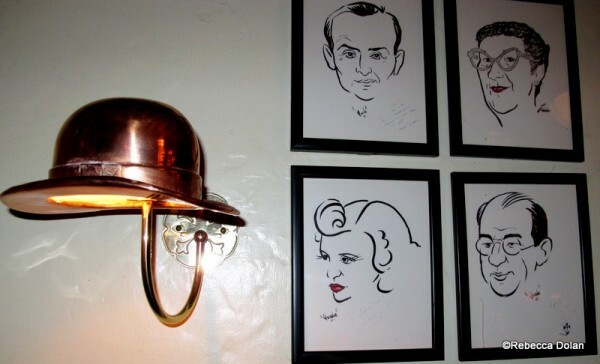 It’s in here that guests get their first glimpse of the Derby’s iconic caricatures. Everyone who was anyone was represented on the walls – see how many stars you can spot. Beyond the hostess desk, guests emerge from the unassuming lobby into the cavernous dining room, which feels like entering into a glamorous Hollywood club. The main floor is flanked on two sides by double rows of booths, the outer two being raised above the rest of the room. Large art deco-esque chandeliers light the room and rich wood accents the walls. Entrants step first onto one of the overlooks, allowing a full view of their dining companions – famous or otherwise. The constellation of stars’ caricatures continues onto these walls, from which bronze derby lamps hang over tables. 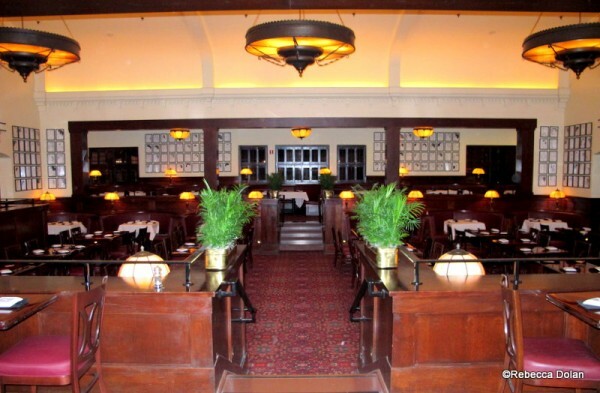 If you can, try to take a seat in one of the rounded booths – perfect for canoodling with your Hollywood heartthrob or generally enjoying a touch of seclusion. As this is the birthplace of the Cobb salad, it felt like a must to order the appetizer size as one of our starters. 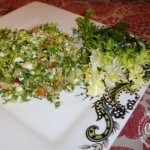 It won’t look like a typical salad, however, since the lettuce and the toppings are all chopped so finely you could, no kidding, eat this salad with a spoon. The kitchen is generous with said toppings; so two people could eat this comfortably. The lobster bisque was a bit on the salty side, and nothing too exciting. 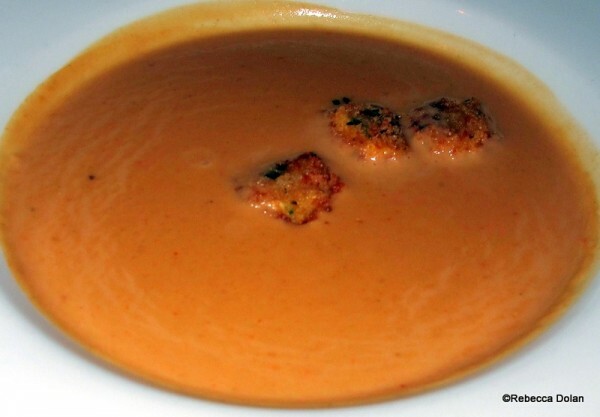 I’ll give it points for being the thickest lobster bisque I’ve ever had. Don’t expect true ravioli to be floating on top, the “ravioli” were more like little dumplings. 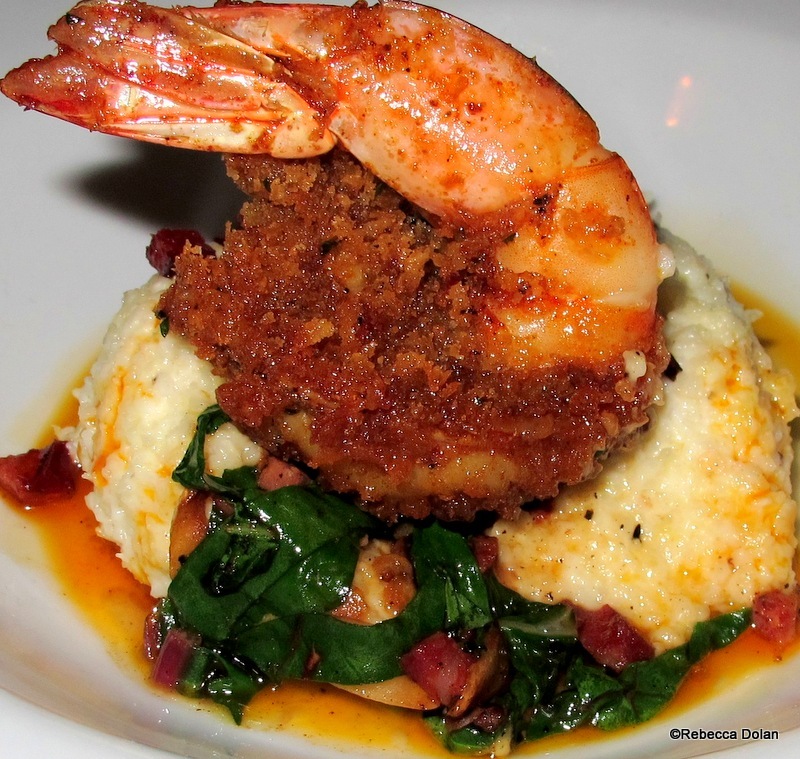 The clear winner in the appetizer category was the andouille-crusted prawn, which sat on a bed of greens and grits. This dish stole this Southern gal’s heart, and I would like to lobby the restaurant for an entrée version. The large shrimp was perfectly cooked, the greens tender, and the grits creamy. There’s only enough here for one, so don’t plan on sharing! 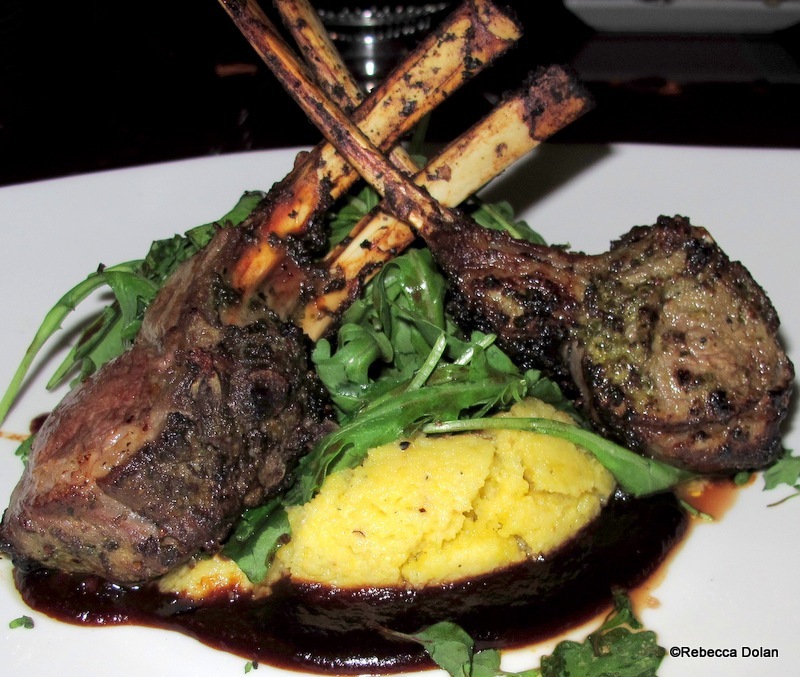 For the next course: the sterling silver pork chop, herb-roasted rack of lamb, and cioppino. 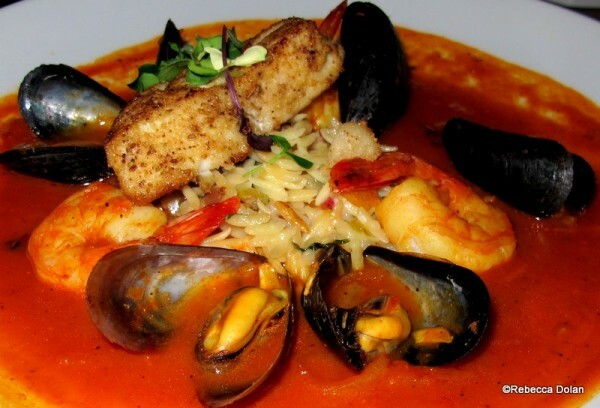 The cioppino was the lightest of the three options, featuring flaky white grouper with just a hint of fennel flavor, plump mussels, and shrimp. A bed of orzo pasta gave the dish some heft, and the whole lot is bathed in a rich (though slightly salty) tomato broth. Both the pork chop and lamb could have easily been shared by two, or satisfied one large appetite. And, it was the meat that made up the bulk of the plates, rather than the sides – not that those were skimpy. The hash under the chop was frankly unexciting, but the blue cheese corn pudding beneath the lamb was stellar. As someone who doesn’t care for blue cheese, I didn’t find it to be overpowering. Instead it lent a nice tang to the rich, creamy pudding. Those who tend to shy away from more gamey imported lamb will particularly like the mellow American lamb used in this dish. 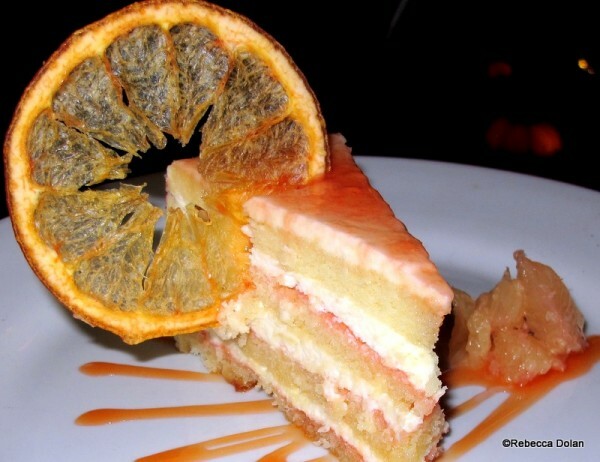 Of course we had to try the Brown Derby’s signature grapefruit cake for dessert. Having citrus flavor in a traditional layer cake was unexpected, but it worked. The grapefruit flavor wasn’t too strong, but its slight bitterness was a nice counterpoint to the cake’s sweetness. I can’t say I was as pleased with the strawberry champagne cheesecake. 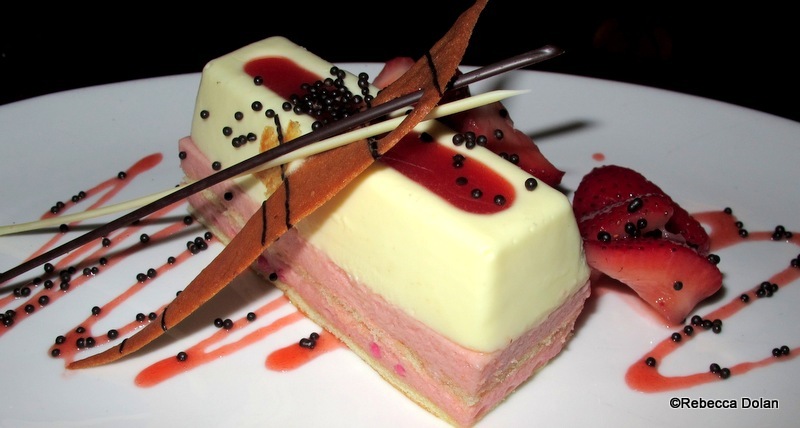 The cheesecake layer, which sat on a layer of strawberry mousse, was much less dense than traditional cheesecake, and more like a cheesecake mousse. But, the real disappointment was that it oddly had no flavor. Both were nice light notes to end the meal, though. 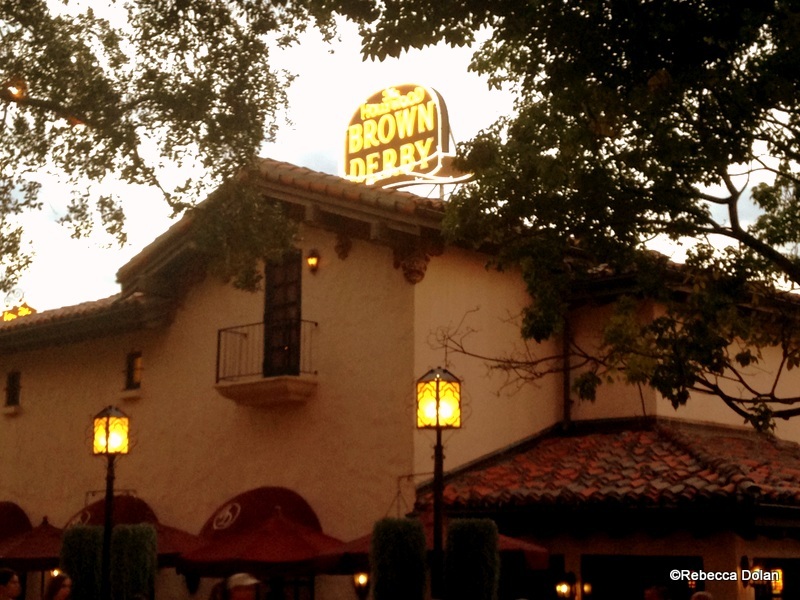 I had never been impressed with my visits to the Brown Derby in the past, but this visit changed my mind. There’s a lot to be said about food that’s gourmet and well-presented but not fussy, and these dishes earned high marks for both preparation and flavor. Plus, you’d probably be hard pressed to find a restaurant with a similar ambiance. 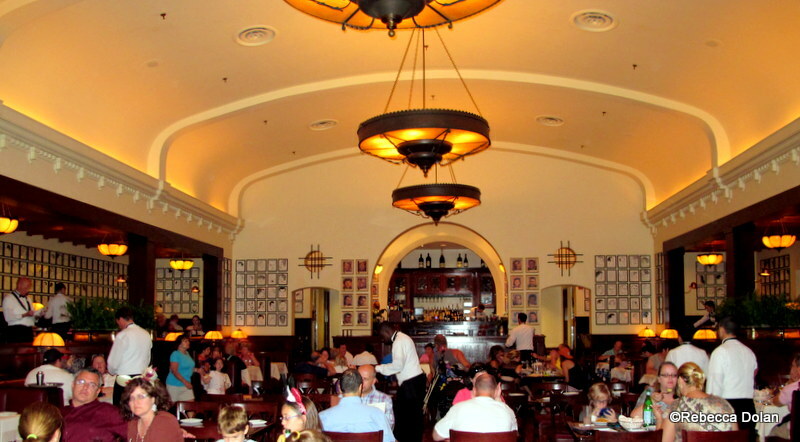 The Brown Derby is an ideal dining spot for those who aren’t quite comfortable in Disney’s fancier restaurants, but want to have an experience that’s a step up from typical table service. 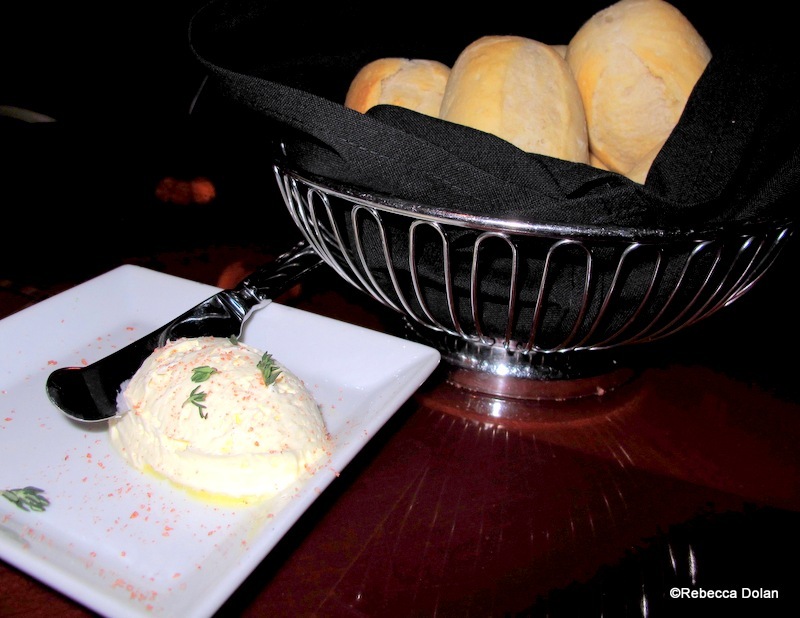 What are your favorite dishes at The Hollywood Brown Derby? Do you recommend this restaurant to your friends? Let us know in the comments below! « News! 2014 Epcot Flower and Garden New Booths and Dishes! I LOVE this restaurant. I’ve never had a bad meal and have eaten there since it’s opened. And now with the outside lounge, it is icing on the cake. Just don’t understand why the restaurant opens at 1130 and the outside lounge at noon. Ambiance, service, food, IMHO, this place has it all. I think the photos for the lamb and pork chops are mis-labeled. Heading to DIsney in March and can’t wait! 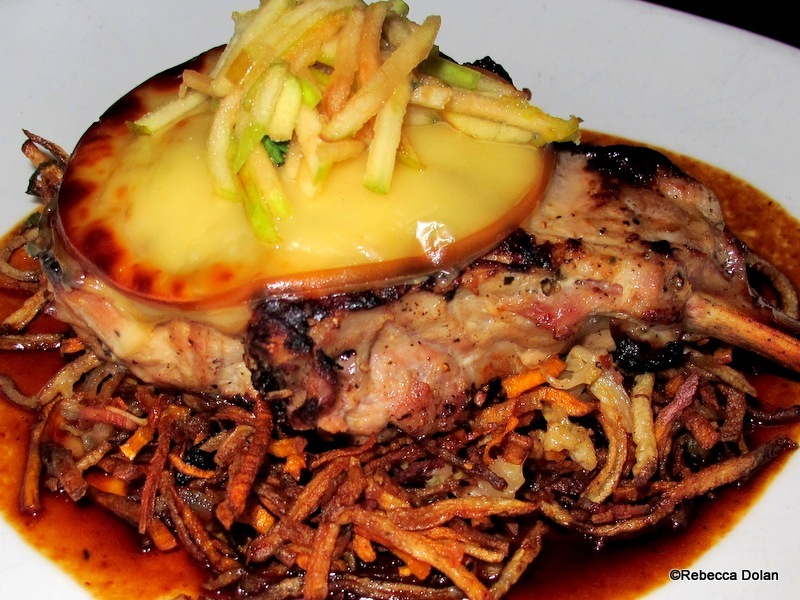 Every review (here, yelp, and tripadvisor) of the pork chop seems to be unanimous that it is just not great. I’m surprised it hasn’t been replaced. We ate here once, and it wasn’t anything special. For the price, the food and service were just meh. I must say, it was quite a let down, and I’m not that picky! I’m sure we should give it another try, but not anytime soon. I think this is a pretty good restaurant in a park with mainly mediocre restaurants. It’s overpriced, but in WDW, that’s not surprising. I like to go here for the Fantasmic package so we can get a nice meal out of the heat and not have to wait in long lines for Fantasmic. Of course we only do this on nights HS stays open late because I refuse to run with the bulls leaving Fantasmic, which is frankly a nightmare. I was there on February 3, 2014. Dessert offerings that day were your choice of a full size grapefruit cake, or choose-3-from-a-set-of-mini-Desserts-menu. Both were offered at $9. My wife and I, both huge dessert fans, passed on dessert. Instead, we grabbed some funnel cake later that night in the MK. 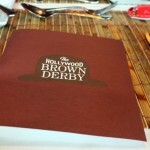 @Melanie — I was never impressed with the Brown Derby either. I’m not sure what they started doing in the kitchen, but this visit was a 180 degree turn around. I’d definitely give it another shot. I had the pork chop last trip and I loved it. The sauce with the hash was divine. Mine came with peach chutney. I had leftovers for breakfast the next day. The toppings for the pork chop change seasonally. 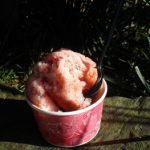 The service was amazing – it was the middle of September and still very hot. My server made sure I didn’t leave without a to go cup full of water to help me stay hydrated. Great service, quiet atmosphere, and terrific food – such a great place to dine every trip! The pork chop is my favorite! We don’t go to the Derby that often, so the accompaniments are always a little different, which is nice. Only once have I found the pork to be a tad overcooked, and it is very hard to cook a chop that big well. Then again, I’m a big pork fan. When I had the chop back in October I thought all the flavors worked very well together, but not necessarily on their own. The Derby is my favorite theme park restaurant; glad to see a good review of it! $12.00 for one shrimp. Sorry… no. Love this restaurant & have never had a bad meal here. Was here for lunch on Jan 4th.2 had the cioppino, 1 had the duck & I had the lamb. Delicious!Grapdfruit cake for dessert. Great atmosphere (ref. I Love lucy) & Great service! Agree with Melanie. Was there in July, 2013. 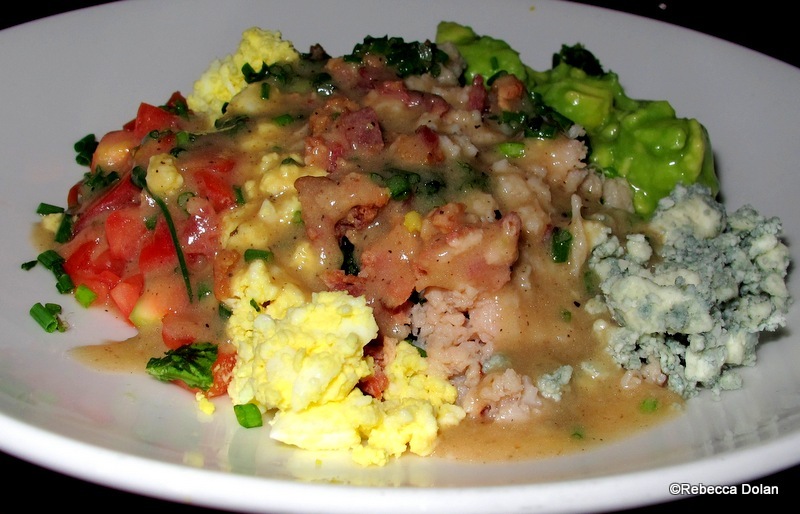 Tried the Cob Salad because of its reputation, not impressed – the blue cheese turned into a rank mess. Creme Bulee was tasteless. Spring rolls were bland. Was not value for money. Should have tried the chicken. It was seriously one of the best dishes I have ever had…and who would every think to say that about chicken? This is one of my favorite restaurants. 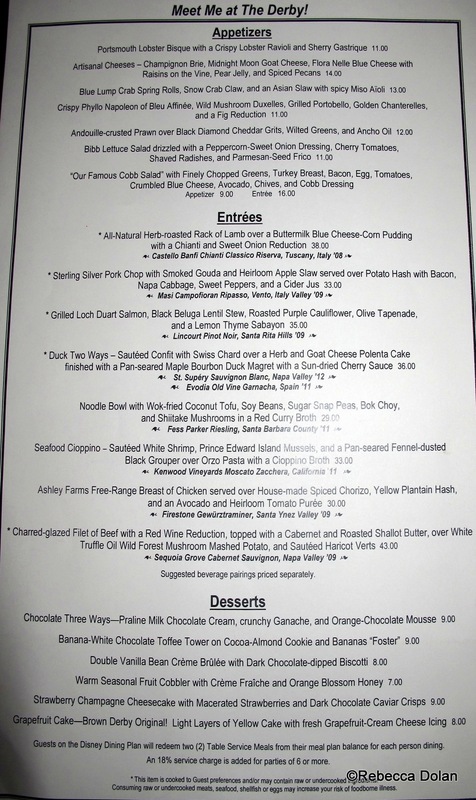 Years ago, the menu was mainly a steakhouse menu with several types of steak and one or two seafood choices. 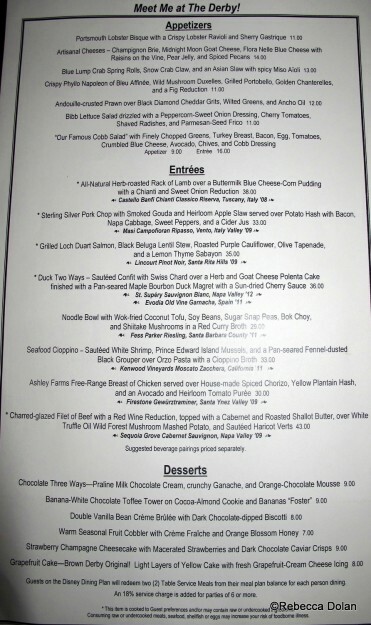 We always loved it until they started changing the menu to include some different food choices and pairings. However, the last time we ate there was last September 2013 and had the filet, which was cooked perfectly. My husband and I shared the prawn app. and it was fabulous and just enough to prevent starving. 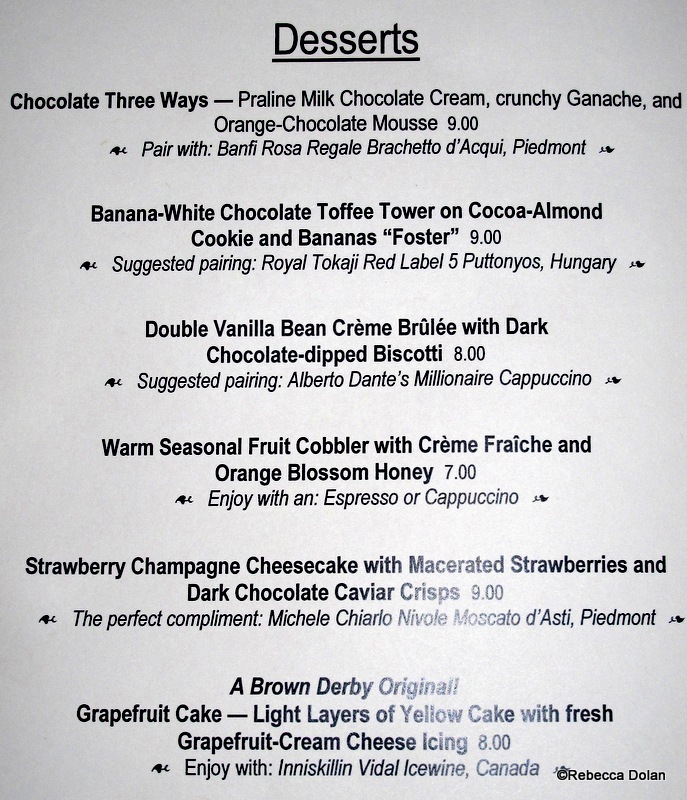 The grapefruit cake is always delicious and the banana caramel dessert is very good too. This restaurant is no more costly than other signature restaurants. We ate here in September 2008 for our honeymoon, and haven’t been back since. It wasn’t that the food was bad, it was just underwhelming. We didn’t see the point in using 2 credits for just “okay” food. 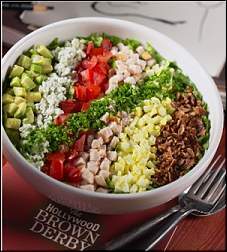 The Cobb salad in the recent pictures look decidedly less appetizing then the ones we had in 2001 and earlier. I showed the picture to the SO and he said “YUCK”. They used to be much better composed and the dressing was in a gravy boat. The mixing of the salad (with just a bit of the dressing) was done table side…the rows of items where much more distinct and the remainder of the dressing was left on the table. I know that’s a press release ‘glamor shot’…but that was exactly the product, including the bowl, we’ve many times up to 2001. We always have to eat here for lunch so my aunt can have a cobb salad. I invariably get the grilled chicken on the kids menu. I’m too cheap to pay for the steak, which is the only thing that appeals to me from their menu. Last time they gave us bowls of the lobster chowder b/c our food was really slow coming out (especially since it was early and they weren’t even half full). My aunt thought it was really good. We came the day after Christmas 2013 and we really enjoyed the Brown Derby. We wanted to see it after watching the “I Love Lucy” episode. It was one of the better restaurants we went to during the trip. I agree that the shrimp and grits version they have was delicious and totally worth trying. The cobb salad was great as usual. I also liked the grapefruit cake, but I really wish it had more grapefruit flavor. 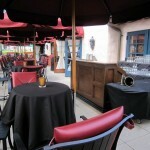 I think it’s worth trying if you want a sit-down dinner while you’re in Hollywood Studios. Great review with lots of pictures! The Strawberry Champagne Cheesecake I had was the best dessert I have ever had in Disney. So much so that I ordered a second one. Maybe you got a bad one but both of mine were insane.